GOLDEN CROSS Senior Ministries – Page 3 – Because no senior should ever have to follow life’s journey alone! Because no senior should ever have to travel life's journey alone! You are helping transform the lives of seniors, one need at a time! 100% of your contribution to the GOLDEN CROSS Senior Residents Fund goes directly to the benefit of the senior residents served. The “13 in 13 Challenge” – YOU DID IT!!!! The 1st 2 Move in Kits were donated to the “13 in 13 Challenge” thanks to individual donations from Colliervile UMC. Then, we got the privilege to speak at a Wednesday evening BBQ dinner at First United Methodist Church in Covington, TN. We were blessed with 3 new Move In Kits. The mail arrived today with an unexpected 6th Move In Kit from the Men’s Club from Ripley First United Methodist Church of Ripley, TN. Move In Kits keep coming! Individual donors have made a real difference in our total. In less than 2 weeks we are nearly at the goal that triggers the match! Move In Kits arrived over the weekend from Flatwoods UMC, Grimes UMC and the Janet Jennings Smith Bible Study class in Paducah, KY.
CONGRATULATIONS and thank you for all you support! 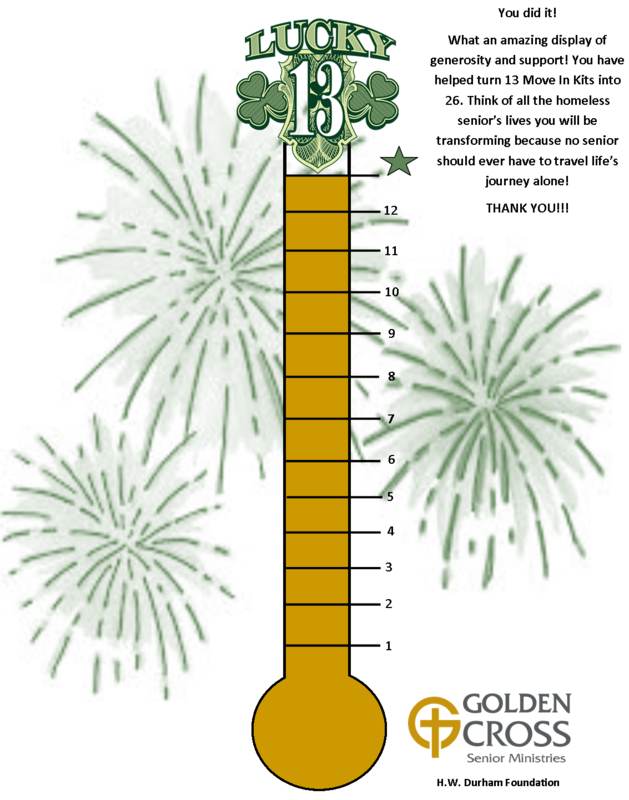 You surpassed the goal of 13 Move In Kits in little over 2 weeks. That means with The Durham Foundation’s challenge grant your 13 are now 26! Just think of all the homeless senior’s lives that will be transformed in the future because you cared enough to step in. Your service is critical because no senior should ever have to travel life’s journey alone. Thank you Christ UMC for your unwavering support! Mr. Thomas suddenly found himself without a place to live. He had been living in a substandard nursing home due to his failing health and disability. The living conditions and care at the nursing home deteriorated to the extent that the state of Tennessee unceremoniously shut it down. One of the state’s Managed Care Organizations knew of Wesley Living’s tenet selection plan preference for seniors presenting as homeless. He now had shelter and little else. Golden Cross stepped in and provided Mr. Thomas with basic furniture and a Move–In Kit. His shelter was turned into his sanctuary! A Move-In Kit consists of all the basic household items needed to start a new home and a month’s worth of non-perishable food. A descriptive sheet is attached. Each Move-In Kit costs approximately $350 to produce. The H.W. Durham Foundation has issued the following challenge grant to Golden Cross. During the next 13 weeks, Durham will match every Move-In Kit donated with a matching Move-In Kit. When you, your group or Sunday School class donates a Move-In Kit, 2 homeless seniors are positively impacted. The 13 in 13 Challenge begins Monday April 23! Donations may take the form of actual items or a monetary donation of $350. The match will occur for the first 13 Move-In Kits donated. Please help turn a homeless senior’s shelter into sanctuary!